Everyone has been wondering when the “Big One” is going to hit California. The discussion has been an underlying topic for years now. It wasn’t until recently that studies providing more answers stirred some commotion in scientists and the public. From a recent study of excavating over 30 trenches along the San Andreas Fault, USGS geologist Kate Scharer and her team spent time investigating the points at which mud, sand and gravel deposits were incidentally torn apart by earthquakes along the fault in the last 1200 years. The evidence found indicated 10 severe earthquakes between 800A.D. and the last occurring in 1857. Consequently, what does this mean for California’s well known central valley highways, commercial infrastructures, power supply and residents? 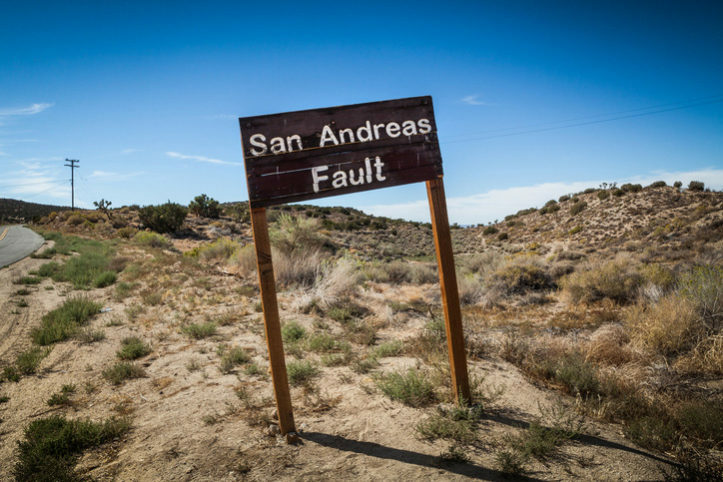 “In order to properly design infrastructure, like highways, water and power lines, so that it can survive the next earthquake, we study how often and how big prehistoric earthquakes were,” Scharer said. “This work provides a new long record where we previously had very little data. The record shows that large earthquakes occurred near Tejon Pass on average every 100 years. Most appear to be quite large, between magnitude 7.0 and magnitude 7.5.” The more data one collects, the more core evidence there is to prove a probable shake-up in the near future. The researchers have also indicated that the land on either side of the fault is building up great amounts of pressure from pushing against each other at an ongoing rate of more than one inch per year since the last upheaval in 1857. All of this collected energy is going to cause a massive release causing perhaps one of the biggest earthquakes California has experienced in many years. From pressure like this, the study also indicates the land moving not by inches but by feet. The 1857 quake ruptured a section 210 miles long. Our well known grapevine highway would become an upheaval of middle Earth! As residence of California, preparedness should become a priority in the home and business place. The wise Benjamin Franklin once said, “By failing to prepare, you are preparing to fail”. All residents can start with a substantial amount of food storage and water to last a duration of at least 3 months. Implementing a home emergency plan is also highly recommended to prevent chaos and indecisiveness in a crisis situation. Realistically, it is not a question of WHEN it will happen, it is HOW PREPARED are California residents for “The Big One”.